Occasionally, we like to offer a glimpse into the lives of our treasured guests. 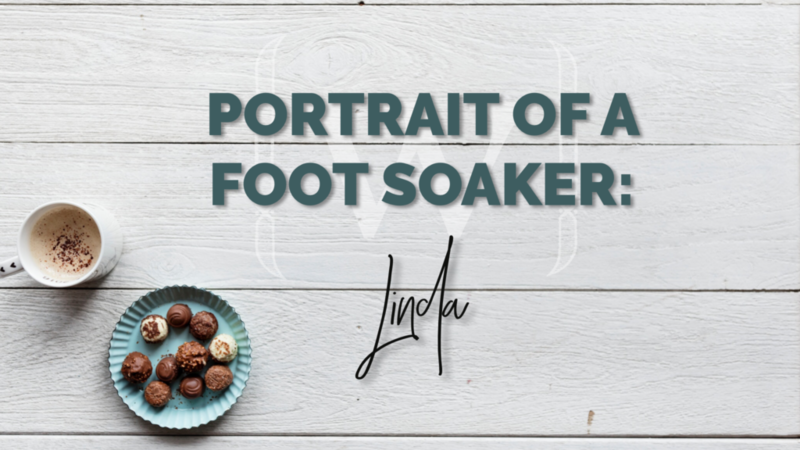 Linda has been a faithful foot soaker since 2016. Our staff knows her for her wonderful stories and personality. We asked this amazing woman about her journey to self-care. I am retired since 2006. I worked for 30 years with the Department of Defense as a Civilian logistics specialist manager. This was a high-stress vocation. Finally, after all those years as a single parent and workaholic, I have learned to balance my life. First, I make sure that daily I slow down, take time for walks, eat healthily (organic/lots of veggies), spend time every day with friends, continue to learn, and volunteer! Every year I look at the buffet of life choices and pick one area to study and do. Qigong was first and I am now an instructor! I also studied art appreciation, at a local community college, then in Spain and Italy, in New York and San Francisco. This year I’m starting the Blue Ridge Eco-Gardening Certificate Program. YES – I pet my dog and give her massages every day. I also do 1-3 hours of Qigong daily, have massages at least once a month, or WALK outside in nature and just breathe! And of course, I go to Wake. I share good and bad news with quite a cadre of friends and depending on the celebrations or the crises, I pick the friends who will either enjoy or assist me comfortably. I have also discovered that my most important support system is my daughter and daughter-in-law. Chocolate! Particularly Chocolate Fetish or French Broad! For the “little” troubles, it’s Dobra in Black Mountain, Owen Park, NC Arboretum, Warren Wilson Labyrinth, or a Parkway outlook. In my mind, when I am truly in the midst of difficulties, I go back in time to a spot in Ohio where the Three Sisters lived. They were 3 intertwined historic oaks – alive since our country became a country. To get to them, you crossed a stepping stone bridge into the preserve. I am living this now! It’s what I do daily. If not now, then when? Thank you, Linda, for your continued support of Wake Foot Sanctuary and for letting our guests have a glimpse into your life and journey. We appreciate all our guests and look forward to featuring another portrait of another guest in the future. If you would like to share your favorite ways to rejuvenate leave it in the comments below!